Check it out! 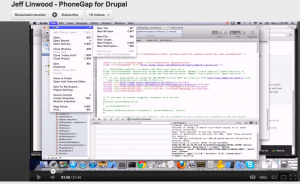 I did a podcast with Brian Lewis of Modules Unraveled, and it’s live today on his web site: Drupal and PhoneGap podcast. I had a lot of fun recording the podcast, having never done one before. Also, I went ahead and did a screencast – most of it is setting up a a basic PhoneGap app in XCode 4 for iOS, with a little dash of Drupal+jQuery Mobile towards the end. Check that out on YouTube – I’d never done a screencast either!